Creating the wow factor in a venue is front and foremost in many event managers’ minds. A stage is often the focal point of any event, whether it be the Glastonbury music festival or a corporate business event. However many buildings, especially in more recent times, are not constructed with large storage spaces for a demountable staging system. Lack of physical resource and manual handling restrictions are also factors when considering retrieving a stage from storage and building it up, especially when there are time restraints. So what if we got rid of our ‘store rooms’ and put the stage into the floor? This might sound crazy but it really works. CPS Alu Top and Motor Up platforms can be permanently installed into a pit as shallow as 200mm deep, and this is easily accommodated by the raised access flooring system used in today’s construction world. When the stage is required for an event, it is simply a case of raising it out of the floor and covering the under-stage void with a valance or fascia panel. Come the end of the event, the stage can be lowered back into the floor allowing the room or venue to be returned to its original condition in a matter of minutes. No stage crew expenses, no logistical problems with dismantling and load-out of the stage; the list goes on. Our Alu Top system is operated by 2 persons and raising and lowering is assisted by balanced gas struts. It takes seconds to raise, lower and lock a platform in position, meaning a complete 6 x 3m stage can be set up and ready to go in around 5-10 minutes. Try that with a demountable system! The Motor Up system goes one step further, introducing servo control which allows complete operation by one person. Platforms are selected via touch-screen control to either drive all platforms, individual platforms or groups of platforms to pre-determined heights. Stage Pits should be prepared in conjunction with CPS drawings so early consultation is required to discuss the necessary details, but, for those who like the nitty gritty details, pits should be 300-400mm larger than the required overall stage size and a constant 200mm deep. We fit the platforms and pit edging, leaving you or your builder to finish the surrounding flooring up to the pit edges. 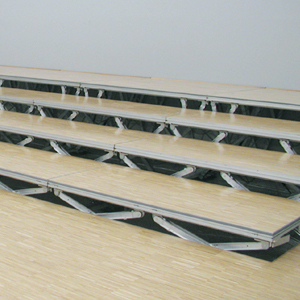 Platforms can be fitted with carpet, vinyl or hardwood flooring to match and we can even line through with existing flooring so that the recessed stage blends in perfectly and doesn’t detract from the main aesthetic of the room. If you'd like more information about this fantastic system get in touch on 01302 234124 or email us at sales@cpsmanufacturingco.com.